It feels odd to do this after 40 posts, but I guess I have been missing this post since a long time; so here it comes – what is my blog all about. I’m basically a software developer @ heart, so essentially this blog will revolve around developing and using software. Being a freelancer & an entrepreneur I do get myself involved with various events & forums that are related to technology or entrepreneurship. I occasionally write about these events. I also sometime write about my thoughts; on anything and everything related to work. Lastly I occasionally write about startups (mostly around Delhi region) that I come across and are doing interesting work. As also predicted in my introductory post here (more than a year ago), the frequency of my posts is not all that good. In this last 13 odd months, I have written 40 posts i.e. ~ 3 posts a month on an average. However since most of my posts are going to be about software they would be relevant for quite some time. 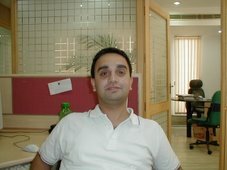 My Name is Guneet Sahai & I’m a Freelance Software Developer based out of Gurgaon (India), working towards my goals. An engineering graduate from IIT Roorke – class of 1999, I’m also a co-founder for chahiye.info which is a portal that intends to offer bouquet of services. am just another Techie from IIT [Roorkee], who has enjoyed working at Startups since 1999 & is now addicted to them. I’m a happily married man, father to two children settled along with my parents in Gurgaon, India. Born in New Delhi (India) I have spent most of my 31 years of life in New Delhi. I have been living in Gurgaon since last three years and plan to settle down here now. My name is Guneet. An engineer by degree with around 8 years of professional experience (at the time of writing this) in building software products. Hold a B.E. in Electrical Engineering from IIT Roorkee (which was earlier known as University of Roorkee). Have worked in 3 start-up organizations in different roles, developing products with Java Programming Language. A happily married man, father to two children settled along with my parents in Gurgaon, India. Born in New Delhi (India) I have spent most of my 31 years of life in New Delhi. I have been living in Gurgaon since last three years and plan to settle down here now. I’m no blogger & I’m certainly not important enough for my writing to be read by others. In short, I’m not writing this for others to read (but if you are reading this, then I have nothing against it – please go ahead). I believe writing this would force me to introspect some aspects of my-self & come out with simple answers to simple questions that recently confronted me. In other words, I’m doing this to crystallize some my thoughts. I keep dreaming (with my eyes wide open) about things & keep thinking about my dreams, but unfortunately these remain as thoughts which come and go & do not translate into actions. Through this blog, I also intend to capture these thoughts and to act on them otherwise dreams would remain what they are & would lose their significance. a) I would at some stage question the usefulness of this practice. A word Document would be much easier to ignore (even with good content) than a Blog. b) Within hearts of heart, I want the world to know about my dreams/thoughts. Being a father to two & having a role in the work place that requires more than 100% of my time, it doesn’t leave me with a lot of time (like all others around me) to blog. Therefore, the frequency of my posts would be irregular. In certain period of time you might find a couple of posts in short span, while I might be missing on this front for a long time at some other time. I guess this would be the usual & typical to most bloggers.